Many Jews – both Ashkenazim and Sephardim – lived in various Asian countries. Steve Lasky indicated that aspects of Jewish life will be presented. The first offering is “Synagogues and Memorials.” Although incomplete, viewers can now see contemporary photos from Hong Kong, Shanghai, Bombay/Mumbai, Cochin/Kochi, Rangoon, Singapore and Istanbul. More will be added. 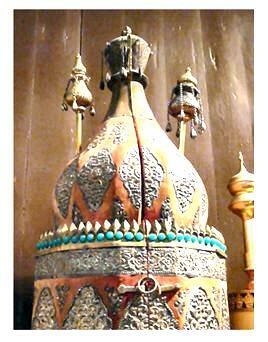 The photo above left is one of the Sephardic Torahs from Ohel Leah in Hong Kong; some scrolls date to the 18th century. On August 7, 1901, Abraham Jacob Raymond, senior member of E. D. Sassoon & Co, laid the foundation stone of the new Sassoon-sponsored synagogue on land donated by brothers Jacob, Edward and Meyer Sassoon. It was named after their mother, Leah Gubbay Sassoon. In 1995, a modern Jewish community center opened next to it. 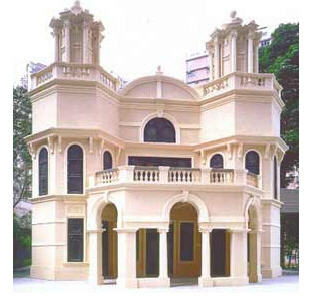 In 1998, the historic synagogue (below) was carefully restored (at a cost of US$6 million) to its original form. It is a UNESCO Heritage Site. Steve asks Tracing the Tribe readers to think about sharing photos they may have taken for places not currently listed. Reach Steve via email. Tracing the Tribe has often written about Asian Jewish communities. Use the search box and plug in the city and/or country of interest and see what’s already been covered here.